Oludeniz is situated just a few minutes from Fethiye and has a crystal-clear lagoon and a beautiful, photogenic grey-white beach that adorns almost every Turkish travel brochure. Despite being developed with many hotels and apartment blocks, the scenery in Oludeniz is spectacular and the town is a lively place to spend a holiday. Perched on the mountain plateau overlooking Oludeniz, the resort town of Hisaronu is packed with bars, nightclubs, shops, and restaurants. With their beautiful, rugged surrounds, both Oludeniz and Hisaronu are fast becoming realised for their potential as outdoor activity destinations. For example, the beach at Oludeniz offers a huge variety of watersports, such as paragliding from Babadag Mountain onto the beach below, and a selection of boat trips depart regularly from Oludeniz or Fethiye for a day exploring the scenic coastline. The numerous paths that wind their way along the hillsides offer spectacular views and sights, including the fascinating 'Greek Village', which was evacuated during the Turkish-Greek war of 1919-1923. Oludeniz has several souvenir shops sprinkled along the Belcekiz beach seafront, and many of the resort hotels and holiday apartment complexes boast their own gift stores. For honest to goodness shopping, however, catch a dolmus into nearby Hisaronu or Fethiye, where it is possible to haggle for bargains. Good buys are leather goods, carpets, jewellery, as well as knock-off designer sunglasses and watches. No-one need go hungry in Oludeniz, no matter what your taste in food, and if you do manage to exhaust the holiday resort's possibilities, there is always Hisaronu just a few kilometres inland with a vast array of restaurants. 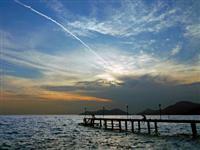 Some recommendations are Buffalo's Steak House at the Flying Dutchman Hotel, renowned for its T-bones; Blue Star Pide and Sultan Ahmet, both offer good Turkish cuisine; and the Belcekiz Beach Club A la Carte for an exclusive Mediterranean night out. Nightlife in Oludeniz is more low-key than in the nearby holiday resorts, concentrated more on chilling out in beachside bars than frenetic clubbing. Those looking to party the night away can take a short trip to Hisaronu, or a little further to Fethiye, and find plenty of action. Among the most popular seafront bars are Buzz Beach Bar, the Sugar Shack, and Crusoe's. Most of the local resort establishments offer live evening entertainment for guests as well. Oludeniz with its stunning blue lagoon is renowned as the most beautiful beach in Turkey, and therefore the water is the main attraction for holidaymakers and particularly paragliders, who come from all over the world to glide over the turquoise waters from atop the Babadag Mountain. Most visitors try out the sport with reliable local operators. Diving and snorkelling are other popular activities. If watersports and sunbathing are not enough, there are dozens of possibilities for excursions in the surrounding area, including a 12-island boat trip, visits to various interesting Greek and Roman archaeological sites, the famous 'Butterfly Valley', or the ghost town of Kayakoyu. Another essential experience is to enjoy a Turkish bath, available in many of the resort hotels. Many visitors have complained about overzealous touts becoming a nuisance, and prices in the resort town have risen in recent years making it rather expensive by Turkish standards. The weather tends to be extremely hot and humid in the height of summer and mosquitoes can be a nuisance.